So you’ve managed to link your turns and you feel confident coming down a blue red or black run. You’ve seen those kids in the terrain park busting big back flips and now you want a piece of the action too. Here are a few tricks to try that will put you on the path to becoming a pro. Not so much a trick in itself, as an essential part of many tricks, learning to ride switch (or fakie) means riding backwards – i.e. putting your worse foot forward. At first you may find this difficult, but learning to ride switch is great for going back to basics and breaking down your technique. It’s also a good thing to try if you are bored of doing a run, of if you are snowboarding with a friend who is a little slower than you. It will test your skills and add another string to your snow bow. Once you have a good feel for riding switch, try turning through 180 degrees whilst in motion, but without leaving the ground. Though it’s a simple manoeuvre, it can look quite stylish to be able to do this in a controlled manner at high speed. 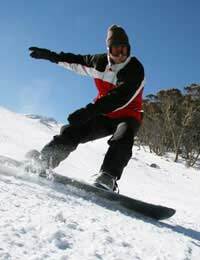 Buttering is the act to putting all of your weight onto the nose or tail of your board so that only the nose or tail is in contact with the ground. The name comes from the term “buttering the muffin” as the board bends like a knife when buttering a muffin or piece of toast. Like riding switch, buttering is a trick which can be used to enhance other more complex manoeuvres. To try buttering, find some ground which is almost flat, for example the area near the bottom of the ski lift, and try moving your weight forward until the tail of your board is off the ground, but you are still in motion. Try holding this position for as long as possible. Then try the opposite, putting your weight on the tail of your board, and pulling a wheelie. The ollie is an essential snowboard trick taken from skate boarding and forms the basis for many other tricks. It is much easier to do it on a snowboard than on a skate board, due to the fact that your feet are attached. The ollie utilises the natural “pop” of your board to do a small jump. These can be practised whilst standing still and then tried whilst in motion. First, with knees well bent, crouch down a little and move your weight to your rear foot. Then lift your front foot and use the pop in the tail of the board to get you into the air. Once you are airborne, shift your weight back into a central position and raise your knees to your chest to gain maximum height. To land, gently lower your front foot which will bring the nose of the board back down to earth, and bend your knees to absorb the impact. Ride off with satisfied grin. Once you have mastered these basic tricks, you’ll be ready to move on to more complex manoeuvres.